Oracle customers who are fortunate to have an Oracle Exadata Database Machine, will need to run “exachk” from time to time, which is pronounced as Exa-Check. 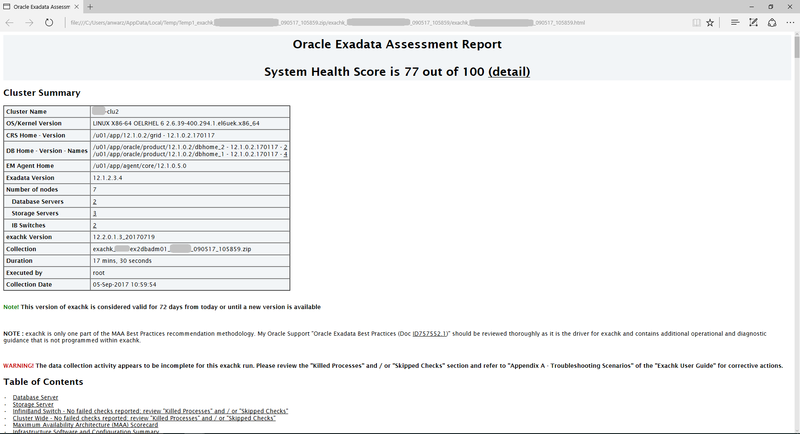 This tool checks your Oracle Exadata Database Machine configuration, software, critical issue and provides a Maximum Availability Architecture score. It is required to run before and after Exadata patching and is good practice to run on a frequent basis and review the recommendations. “exachk holistically evaluates all Oracle Engineered Systems. All checks have explanations, recommendations, and manual verification commands so that customers can self-correct all FAIL and WARNING conditions reported. Searching for running databases . . . . .
Searching out ORACLE_HOME for selected databases.
. . . . . . . . . . . . . . . . . . . . . . . . . . . . . . . . . . . . . . . .. . . . . . . . . . . . . . . . . . . . . . . . . . . . . . . . .. . . . . . . . . . . . . . . . . . . . . . . . . .
Data collections completed. Checking best practices on v1ex2dbadm01. FAIL => One or more storage servers have stateful alerts that have not been cleared. WARNING => ASM parameter ASM_POWER_LIMIT is not set to the default value. WARNING => System has fewer than five storage servers but does not have quorum disks configured on database servers. FAIL => ASM parameter SGA_TARGET is not set according to recommended value. Copying results from v1ex2dbadm02 and generating report. This might take a while. Be patient. Data collections completed. Checking best practices on v1ex2dbadm02. [root@v1ex2dbadm01 exachk]# mv exachk_* ..
It’s normally easier to copy the zip file off the compute node to your machine and then unzip and view the report local. Which knocks out the configuration in iptables and snmpd.conf. SNMP OK - "Linux v1ex1celadm01.v1.com 2.6.39-400.294.1.el6uek.x86_64 #1 SMP Wed Jan 11 08:46:38 PST 2017 x86_64"